Over $3000 in Prizes to Give Away!! Golf getaway for four at the Lake of the Ozarks! !, courtesy of Lodge of Four Seasons and McDonald Outdoor. Estimated value $900. Extra raffle tickets with pre-registration! This is Blake Griffin-Frevert, the 6-year-old son of Kevin and Amy Griffin-Frevert, a patient of the Blood Disorders and Cancer Unit at the University of Missouri Health Care Children's Hospital. 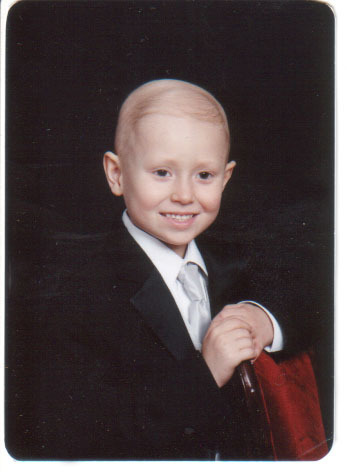 Blake was diagnosed with Acute Lymphocytic Leukemia when he was only fifteen months old. After 18 months of radiation and chemotherapy, and four heads of hair later, Blake went into remission. Now, at six years old, Blake has relapsed and is back in treatment again. But he is still with us. The Cancer Unit of the Children's Hospital is fighting to keep Blake and others like him alive and healthy every day. We want to help the Blood Disorders and Cancer Unit at the Children�s Hospital. We are coordinating a charity poker tournament, all proceeds from which will go directly towards the purchase of needed items from the Unit�s wish list. This is a 21+ event. The tournament will be open to all. Sunday, May 1st, 2005, 1 p.m. to 6 p.m. The Field House has graciously agreed to host our charity tournament this year. This ample-sized venue should be a perfect match for this event, featuring two rooms with full bars and plenty of seating. The back room has plenty of space for tournament tables, and the front room will feature live entertainment and dancing for our guests who don't play-or who finish playing quickly. Guests will also have the option of ordering lunch or snacks from the full Willie's menu, and have full access to the outdoor patio. Poker (particularly No Limit Texas Hold 'em) has exploded in the public consciousness. The last year has seen a breakout into the mainstream, however the trend has been growing steadily for ten years. Poker tournaments of the type we plan to host are now the number-one rated shows on the Travel Channel. ESPN's coverage of the World Series of Poker is the most consistently watched program on that network. Bravo's second highest rated show is Celebrity Poker Challenge. Fox Sports channel has recently started airing No Limit Hold 'em tournaments from Great Britain. Finally, NBC (parent) of Bravo started broadcasting its own Poker tournaments in prime time starting last June. Unlike baseball or football, fans of Poker can play the exact same game (usually with less skill) as the professionals on television. There are no barriers to entry like equipment and playing fields for the average person who becomes interested in playing Poker-and a lot of people have become interested. Poker played by people of all ages is now a $4 billion a year industry. This event will benefit the Children's Miracle Network, a nationally reknowned organization dedicated to raising funds for Children's Hospitals all over the country. All money which is raised locally under CMN auspices stays local. This year's tournament will be run by The Poker Pub, Inc., a professional company that runs free tournaments in venues throughout Arizona, Colorado, Kansas, and Missouri. 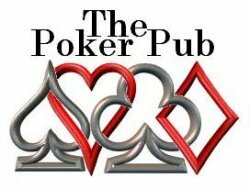 For more information, please see their website at http://www.thepokerpub.com. We will request a $30 donation from would-be participants. The participants will have the option of unlimited add-ons for the first hour and a half as well as an opportunity to re-join the game at the end of the first hour and a half, for which we will request an additional $20 donation. 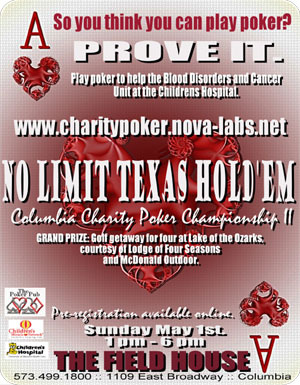 Because this is a charity event, the players will not compete for cash prizes. Local businesses have been kind enough to donate gift certificates, good and services to reward the top competitors. We have already received contributions from the Lodge of Four Seasons, Missouri Symphony Society, We Always Swing Jazz Series, McDonald Outdoor, Abigail's and the Schoolhouse Bed & Breakfast in Rocheport, Sake, Trattoria Strada Nova, Teller's, the Blue Note, Slackers, La Casa Grande, Quinton's, and many more. Further, the tournament is an entertainment event as well. We will provide live music by a variety of local djs, and as previously mentioned there will be a cash bar available. In addition, we will hold a general prize raffle: all competitors and attendees will receive one raffle ticket with entry, and have the option of purchasing additional tickets for $2 each. Individuals who don't wish to actually compete in the tournament can come to socialize, have fun, and support their friends, all in the name of a truly worthy cause. We will request a $5 donation from non-competing individuals, proceeds from which will also go to the Cancer Unit. Please help the Cancer Unit and children like Blake who rely on its services.